I am again at the IIPC WAC / RESAW Conference 2017 and today I am in the very busy technical strand at the British Library. See my Day One post for more on the event and on the HiberActive project, which is why I’m attending this very interesting event. These notes are live so, as usual, comments, additions, corrections, etc. are very much welcomed. New catalogue records processed or enhanced as necessary. One of the intentions of the metadata extraction work was to provide an initial guess of the catalogue data – hoping to save cataloguers and curators time. But you probably won’t be surprised that the names of authors’ names etc. in the document metadata is rarely correct. We use the worse extractor, and layer up so we have the best shot. What works best is extracting the HTML. Gov.uk is a big and consistent publishing space so it’s worth us working on extracting that. What works even better is the gov.uk API data – it’s in JSON, it’s easy to parse, it’s worth coding as it is a bigger publisher for us. We can’t ignore the revisit records… Have to do a great big join at some point… To get best possible quality data for every single thing…. We do need to do more future experimentation.. Multiple workflows brings synchronisation problems. We need to ensure documents are accessible when discoverable. Need to be able to re-run automated extraction. improve HTML data extraction rules, e.g. Zotero translators (and I think LOCKSS are working on this). And we still have that tension between what a publication is… A tension between established practice and publisher output Need to trial different approaches with catalogues and users… Close that whole loop. A1) Currently the same copy for archive and access. Format migration probably will be an issue in the future. A2) That’s great. I’ve been working with the Government Digital Service and they are keen to do this consistently…. Q3) Are these all PDF files? Q4) What does the user see at the end of this… Is it a PDF? Q4) Do they know its from the website, or don’t they care? A4) Officially, the way the library thinks about monographs and serials, would be that the user doesn’t care… But I’d like to speak to more users… The library does a lot of downstream processing here too..
Q5) You spoke yesterday about engaging with machine learning… Can you say more? A6) As things are more dynamic the re-collecting issue gets more and more important. That’s hard for the organisation to adjust to. Ian: Before I start, thank you to my wider colleagues and funders as this is a collaborative project. So, we have a fantastic web archival collections in Canada… They collect political parties, activist groups, major events, etc. But, whilst these are amazing collections, they aren’t accessed or used much. I think this is mainly down to two issues: people don’t know they are there; and the access mechanisms don’t fit well with their practices. Maybe when the Archive-it API is live that will fix it all… Right now though it’s hard to find the right thing, and the Canadian archive is quite siloed. There are about 25 organisations collecting, most use the Archive-It service. But, if you are a researcher… to use web archives you really have to interested and engaged, you need to be an expert. So, building this portal is about making this easier to use… We want web archives to be used on page 150 in some random book. And that’s what the WALK project is trying to do. Our goal is to break down the silos, take down walls between collections, between institutions. We are starting out slow… We signed Memoranda of Understanding with Toronto, Alberta, Victoria, Winnipeg, Dalhousie, Simon Fraser University – that represents about half of the archive in Canada. We are using Warcbase (warcbase.org) and command line tools, we transferred data from internet archive, generate checksums; we generate scholarly derivatives – plain text, hypertext graph, etc. In the front end you enter basic information, describe the collection, and make sure that the user can engage directly themselves… And those visualisations are really useful… Looking at visualisation of the Canadian political parties and political interest group web crawls which track changes, although that may include crawler issues. Then, with all that generated, we create landing pages, including tagging, data information, visualizations, etc. Nick: So, on a technical level… I’ve spent the last ten years in open source digital repository communities… This community is small and tight-knit, and I like how we build and share and develop on each others work. Last year we presented webarchives.ca. We’ve indexed 10 TB of warcs since then, representing 200+ M Solr docs. We have grown from one collection and we have needed additional facets: institution; collection name; collection ID, etc. Then we have also dealt with scaling issues… 30-40Gb to 1Tb sized index. You probably think that’s kinda cute… But we do have more scaling to do… So we are learning from others in the community about how to manage this… We have Solr running on an Open Stack… But right now it isn’t at production scale, but getting there. We are looking at SolrCloud and potentially using a Shard2 per collection. Last year we had a Solr index using the Shine front end… It’s great but… it doesn’t have an active open source community… We love the UK Web Archive but… Meanwhile there is BlackLight which is in wide use in libraries. There is a bigger community, better APIs, bug fixes, etc… So we have set up a prototype called WARCLight. It does almost all that Shine does, except the tree structure and the advanced searching..
Ian spoke about derivative datasets… For each collection, via Blacklight or ScholarsPortal we want domain/URL Counts; Full text; graphs. Rather than them having to do the work, they can just engage with particular datasets or collections. Q1) Do you plan to make graphs interactive, by using Kibana rather than Gephi? A2 – Nick) I kinda did this the ugly way… There is a more elegant way to do it but haven’t done that yet..
Q4) What are some of the organisational, admin and social challenges of building this? A4 – Nick) And when I get back I’m going to be doing some work and sharing to enable an actual community to work on this..
A little bit of context here… University at Albany, SUNY we are a public university with state records las that require us to archive. This is consistent with traditional collecting. But we no dedicated web archives staff – so no capacity for lots of manual work. The seed isn’t a good place to manage these as records. But archives theory and practices adapt well to web archives – they are designed to scale, they document and maintain context, with relationship to other content, and a strong emphasis on being a history of records. So, we are using DACS: Describing Archives: A Content Standard to describe archives, why not use that for web archives? They focus on intellectual content, ignorant of formats; designed for pragmatic access to archives. We also use ArchiveSpace – a modern tool for aggregated records that allows curators to add metadata about a collection. And it interleaved with our physical archives. Users need to understand where web archives come from. They need provenance to frame of their research question – it adds weight to their research. So we need to capture what was attempted to be collected – collecting policies included. We have just started to do this with a statement on our website. We need a more standardised content source. This sort of information should be easy to use and comprehend, but hard to find the right format to do that. This looks like a big JSON file. Knowing what has been captured – and not captured – is really important to understand context. What can we do with this data? Well we can see what’s in our public access system, we can add metadata, we can present some start times, non-finish issues etc. on product pages. BUT… it doesn’t address issues at scale. So, we are now working on a new open digital repository using the Hydra system – though not called that anymore! Possibly we will expose data in the API. We need standardised data structure that is independent of tools. And we also have a researcher education challenge – the archival description needs to be easy to use, re-share and understand. Q1) Right now people describe collection intent, crawl targets… How could you standardise that? Q1) Anything equivalent in the paper world? So, WayBack Search… You can now search WayBackMachine… Including keyword, host/domain search, etc. The index is build on inbound anchor text links to a homepage. It is pretty cool and it’s one way to access this content which is not URL based. We also wanted to look at domain and host routes into this… So, if you look at the page for, say, parliament.uk you can now see statistics and visualisations. And there is an API so you can make your own visualisations – for hosts or for domains. We have done stat counts for specific domains or crawl jobs… The API is all in json so you can just parse this for, for example, how much of what is archived for a domain is in the form of PDFs. We also now have search by format using the same idea, the anchor text, the file and URL path, and you can search for media assets. We don’t have exciting front end displays yet… But I can search for e.g. Puppy, mime type: video, 2014… And get lots of awesome puppy videos [the demo is the Puppy Bowl 2014!]. This media search is available for some of the WayBackMachine for some media types… And you can again present this in the format and display you’d like. For search and profiling we have a new 14 column CDX including new language, simhash, sha256 fields. Language will help users find material in their local/native languages. The SIMHASH is pretty exciting… that allows you to see how much a page has changed. We have been using it on Archive It partners… And it is pretty good. For instance seeing government blog change month to month shows the (dis)similarity. For those that haven’t seen the Capture tool – Brozzler is in production in Archive-it with 3 doze orgaisations and using it. This has also led to warcprox developments too. It was intended for AV and social media stuff. We have a chromium cluster… It won’t do domain harvesting, but it’s good for social media. In terms of crawl quality assurance we are working with the Internet Memory Foundation to create quality toools. These are building on internal crawl priorities work at IA crawler beans, comparison testing. And this is about quality at scale. And you can find reports on how we also did associated work on the WayBackMachine’s crawl quality. We are also looking at tools to monitor crawls for partners, trying to find large scale crawling quality as it happens… There aren’t great analytics… But there are domain-scale monitoring, domain scale patch crawling, and Slack integrations. For doman scale work, for patch crawling we use WAT analysis for embeds and most linked. We rank by inbound links and add to crawl. ArchiveSpark is a framework for cluster-based data extraction and derivation (WA+). Although this is a technical presentation we are also doing an IMLS funded project to train public librarians in web archiving to preserve online local history and community memory, working with partners in various communities. Other collaborations and research include our end of term web archive 2016/17 when the administration changes… No one is official custodian for the gov.uk. And this year the widespread deletion of data has given this work greater profile than usual. This time the work was with IA, LOC, UNT, GWU, and others. 250+ TB of .gov/.mil as well as White House and Obama social media content. There had already been discussion of the Partner Data API. We are currently re-building this so come talk to me if you are interested in this. We are working with partners to make sure this is useful. makes sense, and is made more relevant. We take a lot of WARC files from people to preserve… So we are looking to see how we can get partners to do this with and for it. We are developing a pipeline for automated WARC ingest for web services. 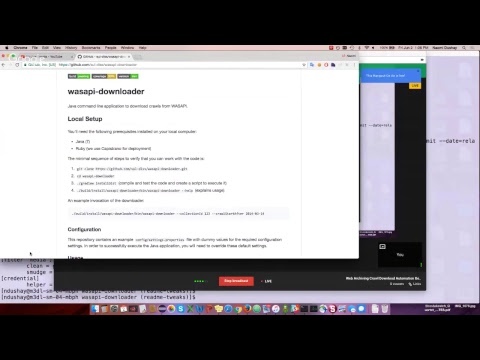 There will be more on WASAPI later, but this is part of work to ensure web archives are more accessible… And that uses API calls to connect up repositories. We have also build a WAT API that allows you to query most of the metadta for a WARC file. You can feed it URLs, and get back what you want – except the page type. Q3) What do you do with pages that don’t specify encoding… ? A3) It doesn’t go into url tokenisation… We would wipe character encoding in anchor text – it gets cleaned up before elastic search..
A5) The crawl is on 100 TB – we mostly use existing WARC and Json pipeline… It performs well on something large. But if a lot of URLs, it could be a lot to parse. Q6) With quality analysis and improvement at scale, can you tell me more about this? A6) We’ve given the IMF access to our own crawls… But we have been compared our own crawls to our own crawls… Comparing to Archive-it is more interesting… And looking at domain level… We need to share some similar size crawls – BL and IA – and figure out how results look and differ. It won’t be content based at that stage, it will be hotpads and URLs and things. Mat: I will be describing tools here for web users. We want to enable individuals to create personal web archives in a self-contained way, without external services. Standard web archiving tools are difficult for non IT experts. “Save page as” is not suitable for web archiving. Why do this? It’s for people who don’t want to touch the commend line, but also to ensure content is preserved that wouldn’t otherwise be. More archives are more better. It is also about creation and access, as both elements are important. So you simply click on the WARCreate button the browser to generate WARC files for non technical people. So, the original app was a tool to enter a URI and then get a notification. The new version is a little more complicated but provides that new collection-based interface. Right now both of these are out there… Eventually we’d like to merge functionality here. So, an example here, looking at the UK election as a collection… You can enter information, then crawl to within defined boundaries… You can kill processes, or restart an old one… And this process integrates with Heritrix to give status of a task here… And if you want to Archive Twitter you can enter a hashtag and interval, you can also do some additional filtering with keywords, etc. And then once running you’ll get notifications. The old mink interface could be affected by page CSS as in the DOM. So we ave moved to shadow DOM, making it more reliable and easy to use. And then you have a more consistent, intuitive iller columns for many captures. It’s an integration of live and archive web, whilst you are viewing the live web. And you can see year, month, day, etc. And it is refined to what you want to look at this. And you have an icon in Mink to make a request to save the page now – and notification of status. So, in terms of tool integration…. We want to ensure integration between Mink and WAIL so that Mink points to local archives. In the future we want to decouple Mink from external Memento aggregator – client-side customisable collection of archives instead. See: http://bit.ly/iipcWAC2017 for tools and source code. Q1) Do you see any qualitative difference in capture between WARCreate and WARC recorder? A1) We capture the representation right at the moment you saw it.. Not the full experience for others, but for you in a moment of time. And that’s our goal – what you last saw. Q2) Who are your users, and do you have a sense of what they want? A2) We have a lot of digital humanities scholars wanting to preserve Twitter and Facebook – the stream as it is now, exactly as they see it. So that’s a major use case for us. Q5) Have you considered a mobile version for social media/web pages on my phone? Q6) Personal archiving is interesting… But jailed in my laptop… great for personal content… But then can I share my WARC files with the wider community . A6) That’s a good idea… And more captures is better… So there should be a way to aggregate these together… I am currently working on that, but you should need to be able to specify what is shared and what is not. Q6) One challenge there is about organisations and what they will be comfortable with sharing/not sharing. Lozana: As you probably know Webrecorder is a high fidelity interactive recording of any web site you browse – and how you engage. And we have recently released an App in electron format. In terms of how we organise webrecorder: we have collections and sessions. The thing I want to talk about today is on Remote browsers, and my work with Rhizome on internet art. And a lot of these works actually require old browser plugins and tools… So Webrecorder enables capture and replay even where technology no longer available. To clarify: the programme says “containerised” but we now refer to this as “remote browsers” – still using Docker cotainers to run these various older browsers. When you go to record a site you select the browser, and the site, and it begins the recording… The Java Applet runs and shows you a visulisation of how it is being captured. You can do this with flash as well… If we open a multimedia in your normal (Chrome) browser, it isn’t working. Restoration is easier with just flash, need other things to capture flash with other dependencies and interactions. Remote browsers are really important for Rhizome work in general, as we use them to stage old artworks in new exhibitions. And with this work we are using WAM – the Web Archiving Manifest. And added a WARC source URI and WARC creation date field to the WARC Header at the moment. So, Jefferson already talked about patching – patching remote archives from the live web… is an approach where we patch either from live web or from other archives, depending on what is available or missing. So, for instance, if I look at a Washington Post page in the archive from 2nd March… It shows how other archives are being patched in to me to deliver me a page… In the collection I have a think called “patch” that captures this. Once pages are patched, then we introduce extraction… We are extracting again using remote archiving and automatic patching. So you combine extraction and patching features. You create two patches and two WARC files. I’ll demo that as well… So, here’s a page from the CCA website and we can patch that… And then extract that… And then when we patch again we get the images, the richer content, a much better recording of the page. So we have 2 WARCs here – one from the British Library archive, one from the patching that might be combined and used to enrich that partial UKWA capture. Similarly we can look at a CNN page and take patches from e.g. the Portuguese archive. And once it is done we have a more complete archive… When we play this back you can display the page as it appeared, and patch files are available for archives to add to their copy. Q1) Every web archive already has a temporal issue where the content may come from other dates than the page claims to have… But you could aggrevate that problem. Have you considered this? Q2) So it’s the closest date to what is in web recorder? A3 – Lozana) Actually for us the key use case is about highlighting and showcasing old art works to the users. It is really important to show the original page as it appeared – in the older browsers like Netscape etc. Q4) This is increadibly exciting. But how difficult is the patching… What does it change? A4) If you take a good capture and a static image is missing… Those are easy to patch in… If highly contextualised – like Facebook, that is difficult to do. Comment – Lozana) We have run UX work with an archiving organisation in Europe for cultural heritage and their use case is that they use Archive-It and do QA the next day… Crawl might mix something but highly dynamic, so want to quickly be able to patch it pretty quickly. Fernando: We are a publicly available web archive, mainly of Portuguese websites from the .pt domain. So, what can you do with out API? Well, we built our first image search using our API, for instance a way to explore Charlie Hebdo materials; another application enables you to explore information on Portuguese politicians. We support the Memento protocol, and you can use the Memento API. We are one of the time gates for the time travel searches. And we also have full text search as well as URL search, though our OpenSearch API. We have extended our API to support temporal searches in the portuguese web. Find this at: http://arquivo.pt/apis/opensearch/. Full text search requests can be made through a URL query, e.g. http://arquivp.pt/opensearch?query=euro 2004 would search for mentions of euro 2004, and you can add parameters to this, or search as a phrase rather than keywords. You can also search mime types – so just within PDFs for instance. And you can also run URL searches – e.g. all pages from the New York Times website… And if you provide time boundaries the search will look for the capture from the nearest date. Joao: I am going to talk about our image search API. This works based on keyword searches, you can include operators such as limiting to images from a particular site, to particular dates… Results are ordered by relevance, recency, or by type. You can also run advanced image searches, such as for icons, you can use quotation marks for names, or a phrase. safe Image (yes; no; all) – restricts search only to safe images. The response is returned in json with total results, URL, width, height, alt, score, timestamp, mime, thumbnail, nsfw, pageTitle fields. A1 – Fernando) This is a closed beta version. Safe for work/nsfw is based on classification worked around training set from Yahoo. We are not for blocking things but we want to be able to exclude shocking images if needed. Q1) We have this same issue in the GifCities project – we have a manually curated training set to handle that. Q3) What is the thumbnail value? This is following on from the presentation myself and colleagues did at last year’s IIPC on APIs. LOCKSS came about from a serials librarian and a computer scientist. They were thinking about emulating the best features of the system for preserving print journals, allowing libraries to conserve their traditional role as preserver. The LOCKSS boxes would sit in each library, collecting from publishers’ website, providing redundancy, sharing with other libraries if and when that publication was no longer available. 18 years on this is a self-sustaining programme running out of Stanford, with 10s of networks and hundreds of partners. Lots of copies isn’t exclusive to LOCKSS but it is the decentralised replication model that addresses the long term bit integrity is hard to solve, that more (correlated) copies doesn’t necessarily keep things safe and can make it vulnerable to hackers. So this model is community approved, published on, and well established. Last year we started re-architecting the LOCKSS software so that it becomes a series of websites. Why do this? Well to reduce support and operation costs – taking advantage of other softwares on the web and web archiving,; to de silo components and enable external integration – we want components to find use in other systems, especially in web archiving; and we are preparing to evolve with the web, to adapt our technologies accordingly. What that means is that LOCKSS systems will treat WARC as a storage abstraction, and more seamlessly do this, processing layers, proxies, etc. We also already integrate Memento but this will also let us engage WASAPI – which there will be more in our next talk. We have built a service for bibliographic metadata extraction, for web harvest and file transfer content; we can map values in DOM tree to metadata fields; we can retrieve downloadable metadata from expected URL patterns; and parse RIS and XML by schema. That model shows our bias to bibliographic material. We are also using plugins to make bibliographic objects and their metadata on many publishing platforms machine-intelligible. We mainly work with publishing/platform heuristics like Atypon, Digital Commons, HighWire, OJS and Silverchair. These vary so we have a framework for them. The use cases for metadata extraction would include applying to consistent subsets of content in larger corpora; curating PA materials within broader crawls; retrieve faculty publications online; or retrieve from University CMSs. You can also undertake discovery via bibliographic metadata, with your institutions OpenURL resolver. As described in 2005 D-Lib paper by DSHR et al, we are looking at on-access format migration. For instance x-bitmap to GIF. Probably the most important core preservation capability is the audit and repair protocol. Network nodes conduct polls to validate integrity of distributed copies of data chunks. More nodes = more security – more nodes can be down; more copies can be corrupted… The notes do not trust each other in this model and responses cannot be cached. And when copies do not match, the node audits and repairs. By all means follow and plugin. Most of our work is in a private repository, which then copies to GitHub. And we are moving more towards a community orientated software development approach, collaborating more, and exploring use of LOCKSS technologies in other contexts. What potential do you see for LOCKSS technologies for web archiving, other use cases? How could we help you to use LOCKSS technologies? How would you like to see LOCKSS plug in more to the web archiving community? Q1) Will these work with existing LOCKSS software, and do we need to update our boxes? A1) Yes, it is backwards compatible. And the new features are containerised so that does slightly change the requirements of the LOCKSS boxes but no changes needed for now. Q2) Where do you store biblographic metadata? Or is in the WARC? A2) It is separate from the WARC, in a database. Q3) With the extraction of the metadata… We have some resources around translators that may be useful. A5 – David) It’s done on the requests in http, which include acceptable formats… You can configure this thing so that if an acceptable format isn’t found, then you transform it to an acceptable format… (see the paper mentioned earlier). It is based on mime type. A6) I’m not sure I have a definitive answer… LOCKSS will still be web harvesting-based. It will still be interesting to hear about approaches that are not web harvesting based. A6) For the CLOCKSS and LOCKSS networks – the big networks – the web harvesting portfolio makes sense. But other networks with other content types, that is becoming more important. Q7) Can you say more about the community project work? A7) We have largely run LOCKSS as more of an in-house project, rather than a community project. We are trying to move it more in the direction of say, Blacklight, Hydra….etc. A culture change here but we see this as a benchmark of success for this re-architecting project… We are also in the process of hiring a partnerships manager and that person will focus more on creating documentation, doing developer outreach etc. David: There is a (fragile) demo that you can have a lot of this… The goal is to continue that through the laws project, as a way to try this out… You can (cautiously) engage with that at demo.laws.lockss.org but it will be published to GitHub at some point. Technical architecture to support this. So, we’ve already run WARC and Digital Preservation Surveys. 15-20% of Archive-it users download and locally store their WARCS – for various reasons – that is small and hasn’t really moved, that’s why data transfer was a core area. We are doing online webinars and demos. We ran a national symposium on API based interoperability and digital preservation and we have white papers to come from this. Development wise we have created a general specification, a LOCKSS implementation, Archive-it implementation, Archive-it API documentation, testing and utility (in progress). All of this is on GitHub. The WASAPI Archive-it Transfer API is written in python, meets all gen-spec citeria, swagger yaml in the repos. Authorisation uses AIT Django framework (same as web app), not defined in general specification. We are using browser cookies or http basic auth. We have a basic endpoint (in production) which returns all WARCs for that account; base/all results are paginated. In terms of query parameters you can use: filename; filetype; collection (ID); crawl (ID for AID crawl job)) etc. So what do you get back? A JSON object has: pagination, count, request-url, includes-extra. You have fields including account (Archive-it ID); checksums; collection (Archive-It ID); crawl; craw time; crawl start; filename’ filetype; locations; size. And you can request these through simple http queries. You can also submit jobs for generating derivative datasets. We use existing query language. So we need some way to bring together these APIs regularly. And also an idea of what other APIs we need to support, and how to prioritise that. Naomi: I’m talking about the Stanford take on this… These are the steps Nicholas, as project owner, does to download WARC files from Archive-it at the moment… It is a 13 step process… And this grant funded work focuses on simplifying the first six steps and making it more manageable and efficient. As a team we are really focused on not being dependent on bespoke softwares, things much be maintainable, continuous integration set up, excellent test coverage, automate-able. There is a team behind this work, and this was their first touching of any of this code – you had 3 neophytes working on this with much to learn. We are lucky to be just down the corridor from LOCKSS. Our preferred language is Ruby but Java would work best for LOCKSS. So we leveraged LOCKSS engineering here. The code is at: https://github.com/sul-dlss/wasapi-downloader/. These videos are how we share our progress at the end of each Agile sprint. In terms of work remaining we have various tweaks, pull requests, etc. to ensure it is production ready. One of the challenges so far has been about thinking crawls and patches, and the context of the WARC. Q1) At Stanford are you working with the other WASAPI APIs, or just the downloads one. A1) I hope the approach we are taking is a welcome one. But we have a lot of projects taking place, but we are limited by available software engineering cycles for archives work. Q2) Jefferson, you mentioned plans to expand the API, when will that be? A2 – Jefferson) I think that it is pretty much done and stable for most of the rest of the year… WARCs do not have crawl IDs or start dates – hence adding crawl time. Naomi: It was super useful that a different team built the downloader was separate from the team building the WASAPI as that surfaced a lot of the assumptions, issues, etc. David: We have a CLOCKSS implementation pretty much building on the Swagger. I need to fix our ID… But the goal is that you will be able to extract stuff from a LOCKSS box using WASAPI using URL or Solr text search. But timing wise, don’t hold your breath. Jefferson: We’d also like others feedback and engagement with the generic specification – comments welcome on GitHub for instance. Jack: We want to talk about securing web archives, and how web archives can get themselves into trouble with security… We want to share what we’ve learnt, and what we are struggling with… So why should we care about security as web archives? Ilya: Well web archives are not just a collection of old pages… No, high fidelity web archives run entrusted software. And there is an assumption that a live site is “safe” so nothing to worry about… but that isn’t right either..
Ilya: Stealing user secrets during capture… Normal web flow… But you have other things open in the browser. Partial mitigation: rewriting – rewrite cookies to exact path only; rewrite JS to intercept cookie access. Mitigation: separate recording sessions – for webrecorder use separate recording sessions when recording credentialed content. Mitigation: Remote browser. Ilya: Not really.. In IE10 the archive within the archive might steal login cookie. In all browsers a site can wipe and replace cookies. Mitigation: run web archive on a separate domain from everything else. Use iFrames to isolate web archive content. Load web archive app from app domain, load iFrame content from content domain. As Webrecorder and Perma.cc both do. Ilya: Threat: Show different age contents when archives… Pages can tell they’re in an archive and act differently. Mitigation: Run archive in containerised/proxy mode browser. Ilya: You can’t do that in Perma because we use frames. But if you don’t separate banner and content, this is a fairly easy exploit to do… So, Mitigation: Use iFrames for replay; don’t inject banner into replay frame… It’s a fidelity/security trade off.. .
Jack: That’s our top 7 tips… But what next… What we introduce today is a tool called http://warc.games. This is a version of webrecorder with every security problem possible turned on… You can run it locally on your machine to try all the exploits and think about mitigations and what to do about them! Q2) Any trends in exploits? A2 – Ilya) We have to get around security policies to archive the web… It wasn’t designed for archiving… But that raises its own issues. Q3) Suggestions for browser makers to make these safer? A5 – Jack) Thanks David! Q8) How can you check the archives and look for arbitrary hacks? IPFS is also known as the distributed web, moving from location based to content based… As we are aware, the web has some problems… You have experience of using a service, accessing email, using a document… There is some break in connectivity… And suddenly all those essential services are gone… Why? Why do we need to have the services working in such a vulnerable way… Even a simple page, you lose a connection and you get a 404. Why? In content addressing we tie content to a unique hash that identifies the item… So a Content Identifier (CID) allows us to do this… And then, in a network, when I look for that data… If there is a disruption to the network, we can ask any machine where the content is… And the node near you can show you what is available before you ever go to the network. IPFS is already used in video streaming (inc. Netflix), legal documents, 3D models – with Hollolens for instance, for games, for scientific data and papers, blogs and webpages, and totally distributed web apps. IPFS allows this to be distributed, offline, saves space, optimise bandwidth usage, etc. Mat: So I am going to talk about IPWB. Motivation here is the persistence of archived web data dependent on resilience of organisation and availability of data. The design is extending the CDXJ format, with indexing and IPFS dissemination procedure, and Replay and IPFS Pull Procedure. So in an adapted CDXJ adds a header with the hash for the content to the metadata structure. A2 – Dave) We use Multihash, using Shard… But you can use different hash functions, they just verify the link… In IPFS we prevent issue with self-describable data functions..
Q3) The problem is that the hash function does end up in the URL… and it will decay over time because the hash function will decay… Its a really hard problem to solve – making a choice now that may be wrong… But there is no way of choosing the right choice. Q4) Is hash functioning itself useful with or without IPFS… Or is content addressing itself inherently useful? Q6) What is the longevity of the hashs and how do I check that? A6 – Dave) OK, you can check the integrity of the hash. And we have filecoin.io which is a blockchain [based storage network and cryptocurrency and that does handle this information… Using an address in a public blockchain… That’s our solution for some of those specific problems. AJ: I’ve been really impressed with what I’ve seen today. There is a lot of enthusiasm for open source and collaborative approaches and that has been clear today and the IIPC wants to encourage and support that. Now, in September 2016 we had a hackathon but there were some who just wanted to get something concrete done… And we might therefore adjust the format… Perhaps pre-define a task well ahead of time… But also a parallel track for the next hackathon/more experimental side. Is that a good idea? What else may be? Comment 1) Why aren’t these sessions recorded? Comment 1) I have a camera at home! NT: I didn’t go to the London hackathon… Now we have a technical team, it’s more appealling… The conference in general is good for surfacing issues we have in common… such as extraction of metadata… But there is also the question of when we sit down to deal with some specific task… That could be useful for taking things forward..
Nick: Do you have GitHub? Just put up an awesome lise! Comment 8) I’m very new to the community… And I was wondering to what extent you use Slack and Twitter between events to maintain these conversations and connections?